Bollywood, as the Indian film industry has come to be known, leads the world in viewer numbers as well as production volumes. Soviet Russia was a key part of that story. A Soviet film promotion poster featuring Raj Kapoor for Shree 420 | Image source & courtesy – timeoutmumbai.net | Click for image. For 2009, tickets sales for Hollywood films were numbered at 2.6 billion viewers. For Bollywood, the number was 3.6 billion. A good 1 billion more. More than the film-going population of USA, EU and Latin America put together. Against some 400 films that Hollywood releases each year, Bollywood releases 1200 odd films. But it was not always like that. Bollywood was post-colonial India’s first major export. In the 1950s, it had a huge following in the Soviet Union, India’s major ally. When leading man Raj Kapoor, a Charlie Chaplinesque tramp, and his heroine Nargis went to Moscow, they were mobbed by fans who shouted lines of songs from their movies, without understanding a word. “Some years ago, when we started showing Bollywood movies in Toronto,” says Madeline Ziniak, vice-president of Omni-TV, “we were pleasantly surprised to find audiences in the Canadian Russian, Romanian, Bulgarian, Czech and Central Asian communities. We couldn’t believe it.” (via How Bollywood conquered the world… – Toronto.com). Way back in 1954, when nearly a million Russian turned up at the Indian film festival in USSR, it seemed more like a flash in the pan. Although Indian films caught on only after Stalin’s death in 1953, small steps to distribute them in the USSR were already being taken in the mid-1940s. Sovexportfil’m set up an office in Mumbai in 1946 to import films from India and ensure that Russian movies were shown here. The early preference was for socialist-themed movies: K Abbas’s Dharti Ke Lal was shown in Russian cinemas in 1949 and Chinnamul in 1951. The watershed occurred in 1954, when a festival of Indian films, including Awara, was held in Soviet cities. Nearly a million people saw Indian movies within the first four days of the festival. From then, Indian movies, mostly in Hindi, were regularly distributed through theatres in the USSR. In all, 210 Indian films were shown in the USSR until 1991, of which about 190 were commercial Hindi movies. Indian movies were embraced for a cluster of reasons. The “melodramatic genre’s explicit juxtaposition of exaggerated good and evil personages found a sympathetic audience”, she writes. The colourful characters, costumes, songs, dances and locations that typify the average Hindi film allowed viewers to indulge in “cinematic tourism”. Indian movies were “skazkas”, or fairy tales; they epitomised “byt” or personal space. 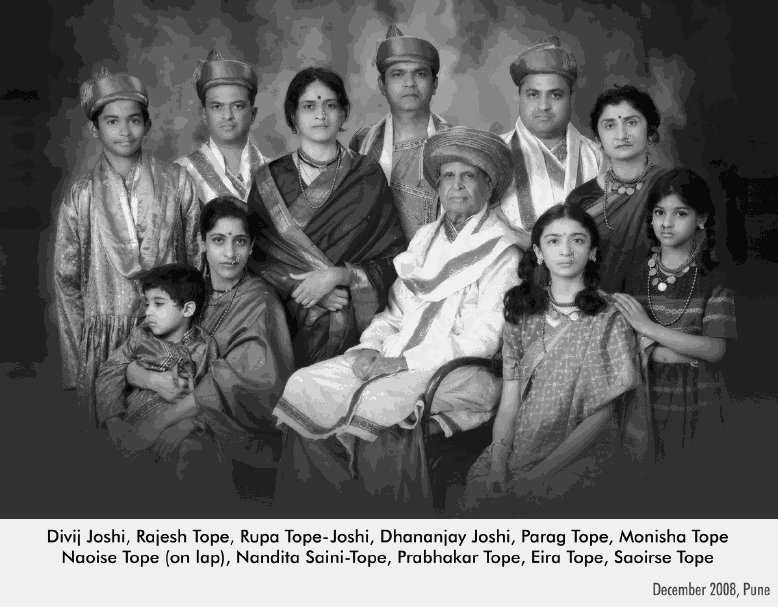 Rajagopalan writes, “Byt was the realm of everyday life that remained untouched by ideology and was removed from if not opposed to the glorified realm of Soviet society.” An affinity seemed to exist between the Indian and the Soviet “dusha”, or inner world. Viewers felt that the situations depicted in Indian cinema were far closer to their own than those depicted in other foreign movies. Over the years, Indian movies raked in the roubles. Love in Simla was the third biggest box-office hit in the USSR in 1963. In 1984, Disco Dancer had the highest audience turnout. Even as debates raged between fans and critics on the worthiness of Indian cinema, Soviet distributors knew that commercial films would guarantee financial returns. Some explanations for this behaviour can be found in Sudha Rajagopalan’s engrossing book Leave Disco Dancer Alone! Indian Cinema and Soviet Movie-going After Stalin. Through research, interviews and questionnaires, Rajagopalan reveals the impact that Indian cinema had on the cultural life of (Soviet Russia). The book maps the period between 1954, the year after dictator Josef Stalin died, and 1991, the year the Soviet Union was disbanded. “What inspired the book was really the fact that historians who have studied the former Soviet Union have looked at Hollywood and its reception among Soviet audiences, but it was news to many in my field that Indian films were an important feature of cultural life in the Soviet Union,” said the 37 year old historian. “So it was clearly a lacuna in historiography that needed to be filled.” (via Byt the bullet – Time Out Mumbai – parts excised for brevity. Supplied text underlined). Most accounts of Bollywood in USSR seem to imply that Bollywood gained access to USSR because of political patronage. The official attention paid to India by the Soviet Bloc, aroused a mix of concern and envy from the West. In fact, commercial success was the main reason. While the success of Awaara has had many tellings, Bollywood’s other successes are not known – at least in India. came the Indian saga about twin sisters, Seeta Aur Geeta (1972), a marvelous reminiscence of distant childhood. Children in Moscow courtyards tried to repeat the circus tricks of the brave heroine, Hema Malini. They copied her tightrope act and her daring manner of behaviour and speech. Indian cinema fans here still remember how one of the twins taught her wicked aunt a lesson. Songs from Indian movies were especially popular in the Soviet Union in the 1980s. The fashion for disco dancing forced young Russians to view Indian cinema differently after the appearance of Disco Dancer (1982). The rags-to-riches story of an ordinary young Indian boy who manages to become a famous singer once again staggered the imagination of Soviet moviegoers. Mithun Chakraborty, the film’s star, replaced Raj Kapoor in the eyes of the new generation. Disco Dancer earned close to 60 mn roubles at a time when movie tickets cost 20-50 kopecks. The dance halls at Soviet summer resorts in the `80s resounded with the sounds of “I Am a Disco Dancer”. Some fanatics were capable of requesting the song ten times over. (via Bollywood returns to Russian screens | Russia Beyond The Headlines). Financed and controlled by party bureaucrats of Soviet Russia, Soviet film production was seriously limited. But the demand for filmed entertainment from the paying Soviet public was greater than the domestic film production in Russia. Unable to deal with commercial uncertainty, Soviet government resorted to imports of ready-made products. Imported films accounted for about 35% of ticket sales at the height of Brezhnev regime in 1970s. Mithun Chakraborty and Shabana Azmi present for Mrinal Sen’s film “Mrigayaa” – exhibited at the X Moscow International Film Festival. Event date – 07/01/1977 | Source & Credit: RIA Novosti | Click for source image. equal representation from each county in all functions, even up to the point of having two directors, one from each country. These coproductions were “meant to create films that would hybridize each culture’s favored motifs and narrative structures, in the hopes of creating truly popular films.” Here are all the Soviet-Indian coproductions she lists: Pardesi (Khozhdenie Za Tri Moray, 1957); Black Mountain (Chernaya Gora, 1971); Rikki Tikki Tavi (1975); Eastward, Beyond the Ganges (Voshod Nad Gangom, 1975); Alibaba and the 40 Thieves (1980); Sohni Mahiwal (Legenda O Lyubvi, 1984); Shikari (Po Zakonu Dzhunglei, 1991); and Ajooba (Chernyj Prints Adzhuba, 1991). Mere Naam Joker (1970) and Mother India (1957) are not listed because they were not full coproductions like the above films (via Minai’s Cinema Nritya Gharana: Indian Dances in Western Films about India: Part 4 (Coproductions). Instead of large capital outlays that Hollywood and Russian films needed, Indian films earned profits for the Soviets. Russians have been enjoying popular Indian melodrama and musicals since the first festival of Indian films in Moscow in 1954. In fact, box office statistics suggest that Indian movies were more popular than any other foreign films shown in the Soviet Union. In the period between 1954 and 1989, for example, while forty-one American and thirty-eight French movies attained “blockbuster” status (defined as selling more than 20 million tickets) in the Soviet Union, fifty Indian movies did the same. (via INDIAN FILMS IN SOVIET CINEMAS reviewed in Slavic Review). For India, cultural exports were an unexpected feather in the cap. Even recently, till a few years ago, exports to Soviet region accounted for between 10%-15% of Bollywood’s overseas revenues. Significantly, this was the largest source of revenues from non-Indian viewers. Till around early the 1980s, the USSR accounted for export of up to 150-odd movies each year. “However, after the disintegration of the country, Hollywood movies took over our market. We now send just four or five movies each year to these countries,” says a Mumbai-based distributor. With increase in interest in Indian movies in Russia in recent months, Parmeshwaran is confident of doubling exports to that country over the next one year. A major delegation of film-makers and producers from Russia is expected to visit the country in November this year. (via Entertainment industry targets new shores – Economic Times). Unlike Hollywood, Bollywood’s growth is based on attracting viewers with a mix of values and vision, a huge talent pool, savvy business minds. Not imperial military might or overwhelming ‘special effects’, powered by raw money power | Image source & courtesy – tribune.com.pk | Click for larger source image. After the break up of Soviet Russia, Bollywood remains a big draw in the Central Asia. All this success has also drawn its own share of backlash – like in Pakistan, Bangladesh, etc. 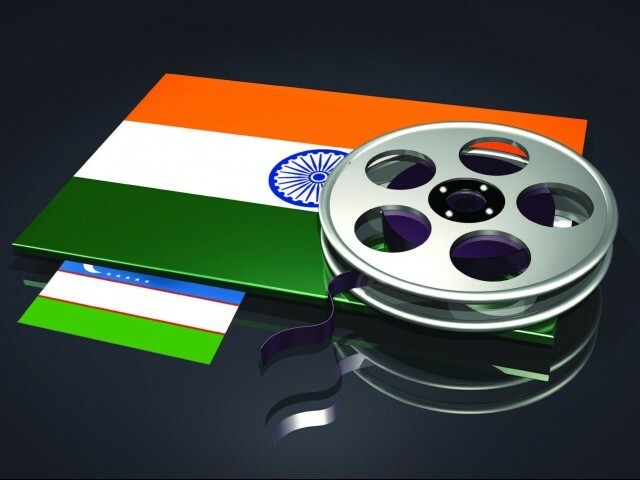 Indian movies are shipped to Uzbekistan from India and are translated into local languages. These movies are not just being showcased in cinemas but are also taking up airtime on local TV channels. “We watch Indian movies at home on TV and listen to Indian songs on the radio all the time,” he says. Uzbeks are still drawn to the choreography and bright cinematography of Indian cinema. The proliferation of this infectious Bollywood glitz and glamour that continues to embed itself in the hearts of Uzbek women, men and youth is not going unnoticed by the government. The government strictly controls the entertainment industry and has take measures to try and protect the industry. President Karimov’s government is currently chalking out strategies to promote Uzbek movies at home over Indian movies. The government has written scripts and engaged the entertainment industry in its effort to reintroduce Uzbek youth to the country’s indigenous culture. Today there are more than 50 private film studios in Uzbekistan that produce about 50 films a year. The personality that seems to be embedded in the minds of most of today’s Uzbeks is that of Indian actor Mithun Chakraborty, who came to the country in 1980 to shoot Ali-Baba and the Forty Thieves. The movie, shot by an Uzbek film studio in collaboration with India, was one of the biggest international projects filmed in Uzbekistan during the Soviet era. Obid Karimov, a local in Tashkent, says the ‘great movie’ also starred legendary Uzbek comedian Asomov and was one of the best-selling movies of all times in the Soviet Union in the 80s, and was watched by millions of viewers in USSR alone. Although the country always embodied aspects of different cultures, what seems to be gaining popularity today are Bollywood hits. “Bollywood is fantasy, and we love being a part of the journey, even if it’s just for a few hours,” says Obid. The Uzbek film industry, in an attempt to keep its audiences’ interest, has in fact started to elements of Indian films in their own productions. “The characters [in some recent Uzbek films] are larger than life just like in an Indian movie, but the ending is usually sad like a Russian drama,”adds Obid. An official from the Pakistan Embassy in Uzbekistan says that the influence of Bollywood is “huge” (via Bollywood calling: The fall of Uzbekistani cinema – The Express Tribune). In Russia (like in Pakistan), there are indications that families and women are more loyal to Bollywood films. With Bollywood busy promoting itself at Cannes, Canada and USA, stronger markets have been ignored by Bollywood. In Brazil, a Bollywood style tele-novela, Caminho das Índias (Road to India), a TV soap opera based on Indian themes became a huge success – and stirred some controversy. Similarly in Russia, too, a prominent media group, Red Media has launched a Bollywood channel, which will air Bollywood-style content that the Russian studio will produce on its own. 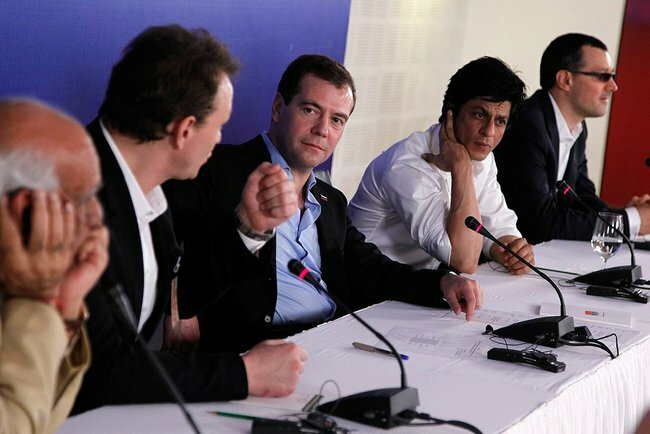 President Dimitry Medvedev, , Yash Chopra, Shahrukh Khan at press conference. Russia continues to love Indian cinema classics from the 1960s and 1970s. These are the films most talked about on Internet forums, where fans lovingly collect photographs and stories of their idols. They constitute a retrospective of Indian cinema that is regularly shown on Russian television, especially the Domashny channel, which is aimed at women and promotes family values. For Russian fans of Indian films, there is even a special satellite channel called India TV. Russia’s love of Indian films has now spilled over into a mass passion for Indian dance. Every self-respecting sports club in Moscow teaches yoga and the art of Indian dance. Russian girls array themselves in saris for these lessons, which are more popular even than traditional European fitness classes. (via Bollywood returns to Russian screens | Russia Beyond The Headlines). President Dmitry Medvedev, on his visit to India, made time to meet up with some Bollywood biggies – and tried to re-ignite the old Indo-Russian fires. Soviet directors like Bondarchuk, Tarkovsky moved to Hollywood. This move, assuming endless financing for their creative output, did not quite turn out like that. The studio system worked pretty much like Soviet bureaucracy to limit their production – as evidenced by their limited output in the West. Within the Soviet film industry itself, there was much admiration for Hollywood and Western film genres and styles. Interestingly, Indian critics have seen Bollywood films as sub-standard – much like Bollywood sees itself, also. But the viewers aren’t paying attention to carping critics and ‘superior’ art-film ideologues. Superb.. Felt pride and Joy readin this.. Thanks.. Interesting Thoughts, A wide range of citizens familiar with Bollywood tends to suppose Aishwarya Rai as the Bollywood queen but admirers of bollywood is aware of the truth. Aishwarya Rai could quite possibly have won Miss Marketplace amount but she is no comparison to Priyanka Chopara, the true elegance of the the Bollywood. In actuality Priyanka is also previous Pass up Community and acts in Bollywood films. I am a follower of your writing. Though many arguments and associations do not convince me, I still look forward to your opinions, which are based on direct evidence and hard facts. This critical temper is absent in most Indians today, who prefer fancy theories and the nonsense that is given to them by their civilizational enemies. I wish our policy makers would reason like you, first collect the facts, interact with people to find out their requirements and act to solve the problems. Instead they imported foreign models like five year plans, green revolution (paraded as a success) etc which have compromised our agriculture, defense and finances. I am fearful for the integrity of this country . Relax! We’ll be fine. No fear. Hahaha. This is funny. Foreigners always forget about the demographics of India. India has many languages, and so films will be made in many of these languages as well. Bollywood represents the Hindi language industry based in Mumbai, India. They make around 200 films a year. Yes, it is true Indian cinema churns out around 1,200 films a year. But Bollywood (a PART of Indian movies) makes around 200. That’s around 17% rounded. In conclusion, 83% of Indian films released yearly are not Bollywood films. but These are Indian Movies may be not named as Bollywood because they are not made in Mumbai but that doesn’t meant not from Bollywood.They are dubbed in other languages in India. But this your thought nobody control it. Thank you for this splendid and well-researched article. Please also post more articles on the influence of Bollywood around the world, like the Middle-east or Africa. The last few years have seen the entry of exciting new directors like Anurag Kashyap, Anurag Basu, Sujoy Ghosh and Dibakar Bannerjee, who have provided a different take from the usual overly sweet “romantic musicals”. I believe with the right marketing, Bollywood can go truly global. For example, Barfi! is as a good a movie, as any released by hollywood this year. Usually Indian films had the same formula. Boy meets girl, girl meets boy. They fall in love, they can’t be together. She cries and runs, usually through a beautiful green field and it starts raining. Hahahaha! But now it seems the scripts are evolving and changing. Good for them. I guess people needed the escape from reality in those days. Bharat-tantra - Prequel To Modern History!